Forest Lake Doctors medical center prefers working on an appointment system to provide optimal care and treatment to all the patients. Our services are not restricted to just one location; rather we provide our medical services even in the suburbs of Forest Lake. 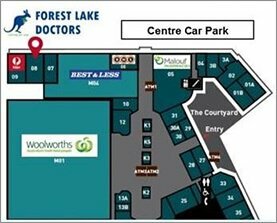 Our booking services are open from 8:00am and you can book doctor appointment at Forest Lake Doctors during our booking hours. You appointment can be booked by a telephone call or by online booking via Health Engine. While most of the appointments are booked for 10-15 minutes, if required the doctor will spend more time checking you. At Forest lake Doctors medical center we ensure you do not have to wait for long as we treat the other patients. We adhere to all our appointment schedules and try to treat all patients on their appointment time; however, in case there are certain changes we make sure you never have to wait really long. In case of a medical emergency we’ll make sure our best medical services reach you immediately. Also, in case you want to cancel an appointment for the day or time, we sincerely request you to cancel the appointment over a phone call.